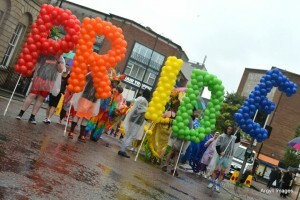 Despite torrential rain, tens of thousands of people marched through the streets of Belfast in the culmination of Belfast Pride 2014 – the parade was opened by the Mayor of Belfast, Councillor Nichola Mallon who was greeted enthusiastically by the crowds and the Mayor was much in demand for numerous pictures along the route with spectators. There were a range of floats taking part in the parade, many reaching new heights of creativity and bringing much appreciated colour to the streets on a wet Saturday afternoon. The performers on the floats kept waving and were joined in the parade by a record number of walking groups from businesses, trades unions, political parties, statutory agencies and community groups. Belfast Pride aimed to put Pride at the centre of Belfast this year and once again the parade filled the long route from the Albert Clock, along Royal Avenue, around the City Hall and via Queen Street, Castle Street and High Street to Custom House Square for the popular Party in the Square concert which features high profile acts including Stooshe, Micha B and Ryan Dolan. PreviousPrevious post:Join Pride Arts.NextNext post:Action for Equality – Tonight, Tuesday.